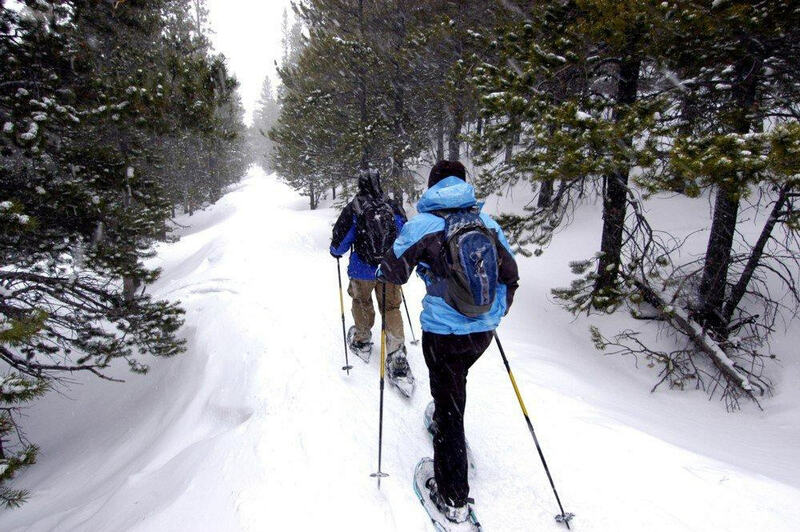 This winter get outdoors and enjoy an invigorating inn-to-inn snowshoe trek in the quiet woods of the Mt. Sunapee region of New Hampshire, and then relax in the cozy comfort of two award-winning country inns. Because of their popularity last winter and the ever-increasing popularity of snowshoeing, The Rosewood Country Inn and The Candlelite Inn are adding three more weekends to their “Inn to Inn Snowshoe Getaway” packages. The package includes accommodations for two nights (one night in each inn), a full country breakfast each morning, fireside dinner each evening, a guided snowshoe trek from one inn to the other, and luggage transfers between the two inns. Last February we enjoyed a great weekend getaway with this inn-to-inn trek. We arrived at The Rosewood on Friday and settled into this tastefully elegant country inn. Before dinner we gathered with fellow trekkers in the inn’s cocktail lounge for a brief orientation and the complimentary hors d’oeuvres (cash bar available). A delicious four-course dinner followed. Later, we retired to one of the inn’s luxuriously-decorated rooms, complete with fireplace and canopy bed. The next morning we awoke to a wonderful country breakfast and prepared for an energizing trek over peaceful forested trails to The Candlelite Inn. The guided trek is invigorating, but not overly strenuous. A trailside lunch was included. Once at The Candlelite, we took the rest of the afternoon to relax in this cozy, comfortable inn reading a good book and working on a puzzle in the inn’s sitting room. You can also take some time to explore the Mt. Sunapee region. That evening another wonderfully-prepared dinner was served by the gracious innkeepers, followed by a hearty country breakfast on Sunday morning. Add even more romance to your weekend by taking a horse-drawn sleigh ride right from the back door of The Rosewood. If you’re looking for even more activity, alpine skiing is available at nearby Mt. Sunapee and Pat’s Peak in Henniker. The Sunapee area is also great for snowmobiling and cross-country skiing on a network of maintained trails. Or pack your ice skates and take a turn on one of the many outdoor rinks in the area. If the weather doesn’t cooperate and snowshoeing is not an option, then the trek becomes a guided hike. Snowshoe rentals are available through the inns. The Inn-to-Inn Snowshoe Adventures for 2012 will be offered the weekends of Jan. 13-15, Jan. 20-22, Feb. 3-5, Feb. 20-22, and March 9-11. Cost for the package is $299 per person/dbl. occupancy. 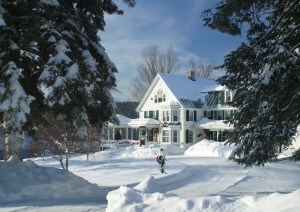 In addition to the Inn-to-Inn Snowshoe Adventure, the inns offer a four-night Over the River and Through the Woods Winter Wonderland Package starting at $449 per person on December 26 – 30 and February 20 – 24, 2012. After arriving at The Candlelite Inn on Monday, enjoy dinner served in the dinning room. After a hearty breakfast on Tuesday morning, get outdoors and enjoy snow tubing at Pat’s Peak. An early dinner is planned at Daniel’s Restaurant (10% discount on the meal included in the package) on the way back to the Inn. After another delicious breakfast on Wednesday morning, set out on a snow shoe trek to the Rosewood Country Inn with a knowledgeable guide. En route, enjoy a backpack lunch trailside. Later, relax and enjoy pre-dinner hors d’oeuvres by the fire in the Inn’s tavern followed by a four-course dinner. Thursday wake up to a fireside breakfast; then try ice skating on the town green in New London or do a little tax-free shopping at some of the local artisan shops. Then it’s back to the inn at 12:30 for a romantic sleigh ride before a cozy fireside lunch. Dinner is on your own at one of the local restaurants. Friday enjoy a leisurely breakfast before saying good-bye and heading home. This package includes 4 nights accommodations, 2 dinners (one at each inn), 4 breakfasts, snow tubing, guided snow shoe trek, a backpack lunch, sleigh ride, and a fireside lunch. Winter isn’t the only time to getaway to the Rosewood and Candlelite Inns; other inn-to-inn specials include guided bike tours and hiking tours. The individual inns also offer a variety of special packages and events such as the Moose Lick Tours with Swamp Donkey Adventures or the Wildlife/Moose Canoe Tours from May through July. The Summer Sampler in June and July includes garden tours at Tarbin Gardens, the Fells, St. Gaudens, and a scenic cruise on Lake Sunapee. For more information visit the inns’ websites or call 800-938-5273 or email rosewoodinn@tds.net, or 888-812-5571 and candlelite@conknet.com for the Candlelite Inn.